Discussion in 'Stock Market Today' started by bigbear0083, Apr 13, 2018. 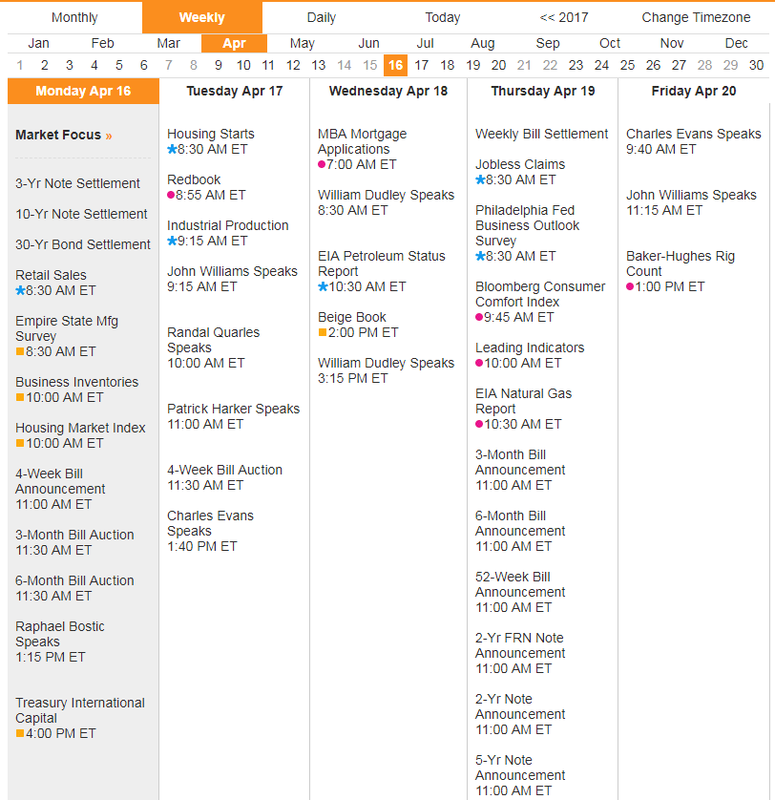 Welcome Stockaholics to the trading week of April 16th! Trade talk and politics could hang over the market in the coming week, even as dozens of major earnings reports could provide a bright spot. But the market will also focus on any new developments around President Trump's trade conflict with China; his possible firing of senior DOJ personnel over the Mueller investigation, and developments around the administration's response to Syria. Strategists have been hoping earnings will steal the focus from negative topics, such as tariffs. "Everybody that I know expects earnings to be very, very strong and very, very good. The bottom-up consensus is 18, 18.5 percent [profit gains] already. Our bottom line is we think the beats will be very significant," said one strategist. Trade talk and politics could hang over the market in the coming week, even with a blast of earnings news providing a bright spot. 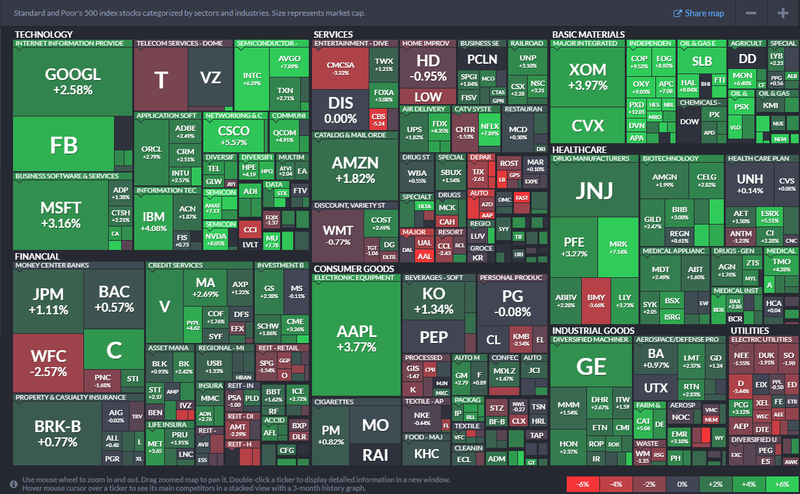 A handful of Dow components report in the week ahead, along with dozens of S&P 500 companies, including Procter and Gamble, IBM,American Express and Johnson and Johnson. Earnings growth for the first quarter is expected to be up about 18.5 percent, according to Thomson Reuters. The first three major banks, J.P. Morgan Chase, Citigroup and Wells Fargo, to report earnings Friday all beat expectations. But their stocks traded lower Friday on disappointment that their earnings gains were not more broad-based. Bank of America reports Monday and there is a slew of other financial names, including US Bancorp and KeyCorp reporting. "If this is any indication of how earnings season is going to go, it's time to look closely at your portfolio. 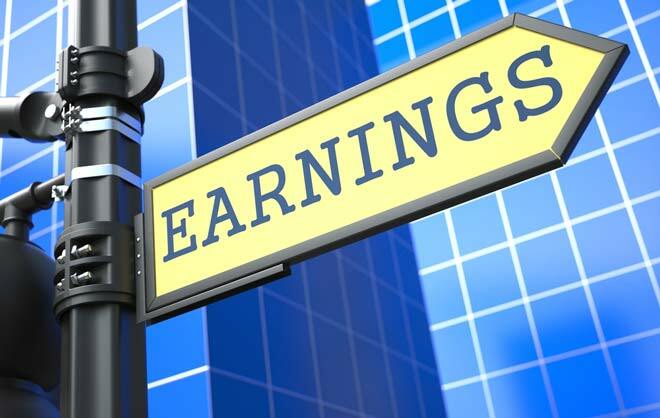 Even if you deliver good earnings, it doesn't mean the market will reward you," said Peter Boockvar, chief investment strategist at Bleakley Financial Group. Stocks were higher for the week, with the S&P 500 up nearly 2 percent at 2,656. But Friday was weak, and traders were concerned about the possibility that the U.S. could bomb Syria over the weekend or that President Donald Trump would fire Deputy Attorney General Rod Rosenstein. Trump has said the U.S. would respond to the deadly Syrian gas attack on civilians, and the market has been anxious that Syria and the war in Yemen have the potential to escalate. West Texas Intermediate crude futures rose 8.6 percent in the past week to $67.39, their best weekly gain since July. Analysts have said Trump could seek to replace Rosenstein with someone who would limit the scope of special counsel Robert Mueller's investigation to focus on just collusion with Russia. Mueller's team is reportedly close to closing its obstruction of justice probe, according to NBC News. In the Treasury market Friday, investors bought the long end, or 10-yearsector. Yields move opposite price, and the 10-year yield moved lower to 2.82 percent. At the same time, the yield on the 2-year rose. The two yields are now the closest together, or the "flattest," they've been since 2007, at 46 basis points. The spread between the 2-year and 10-year has been flattening as the Fed has moved to raise interest rates. A flattening yield curve takes it closer to inverting, which means the 2-year yield would rise above the 10-year yield. An inversion is seen as a sign of a pending recession, but a flattening curve is not. "It's basically saying we're not excited about growth. We're just kind of stuck in neutral," said Aaron Kohli, fixed income strategist at BMO. He said the market was concerned by headlines Friday about Trump ramping up the trade dispute with China. "None of that is helpful." As the curve flattened Friday, the 2-year yield jumped to 2.37 percent, the highest since 2008. "Ignoring this continued rise in short-term interest rates is a mistake. People should remember the catalyst of the sell-off in early February was rising interest rates. We are going into a weekend with the 2-year at a fresh nine-and-a-half-year high," said Boockvar. "People are obsessed with Facebook and tariffs and are forgetting about rising interest rates." Banks could stay a big focus for markets in the week ahead, as Fed Vice Chairman Randal Quarles testifies before both House and Senate committees Tuesday and Thursday on banking regulation. In the past week, the Fed said banks should be allowed to take on more leverage. There is some data in the week ahead, with retail sales Monday topping the list of economic reports. Housing starts are reported Tuesday, and the Fed's beige book on the economy is released Wednesday. Trump meets with Japan Prime Minister Shinzo Abe in Florida. The discussions are expected to focus on North Korea as the Trump administration works to set up a summit with North Korean Leader Kim Jong Un. But trade is also a likely topic, as Trump seeks a bilateral agreement with Japan. The administration could also reveal more about Trump's plan to add more tariffs to another $100 billion in Chinese goods. Strategists have been hoping that earnings news would draw investor focus away from other issues such as trade. Binky Chadha, chief global strategist at Deutsche Bank, said the earnings season could be very good for stocks, and it has proven to be in past quarters. "Everybody that I know expects earnings to be very, very strong and very, very good. The bottom-up consensus is 18, 18.5 percent already. Our bottom line is we think the beats will be very significant. If earnings always beat by 3.5 percent, that takes you to about 22 percent already," he said. Chadha said his model, without accounting for the corporate tax break, was a 22 percent first-quarter profit gain, and the earnings beats could take growth to 25 percent or higher. "I would argue the risks to my number are to the upside once you get into deeper and nitty-gritty issues," he said. He said if there is a geopolitical incident that knocks down the market, such as an attack in Syria, the market could sell off and then quickly correct. Despite massive volatility on a day to day basis, it may sound hard to believe, but the S&P 500 is currently trading right where it was nearly two months ago on February 13th. You read that right, in what has been the most volatile market environment in at least a couple of years, the S&P 500 has nothing to show for it – up or down! In terms of individual sectors, we’ve seen some rotation. While Technology continues to be a market leader, it has been joined by former laggards like the Energy (+5.1%) and Utilities (0.5%) sectors to the upside. 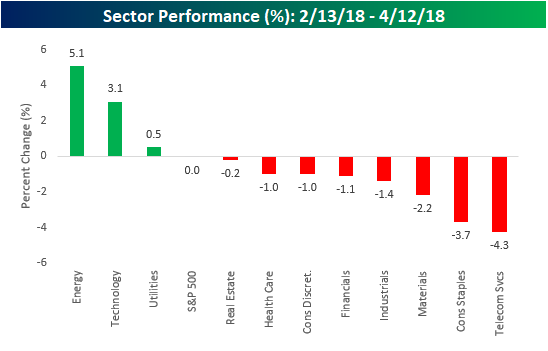 On the downside, Telecom Services, Consumer Staples, and Materials are all down over 2%, while Industrials, Financials, and Consumer Discretionary are down a percent. As far as individual stocks are concerned, 250 stocks are up and 250 stocks are down, so it couldn’t be more balanced. 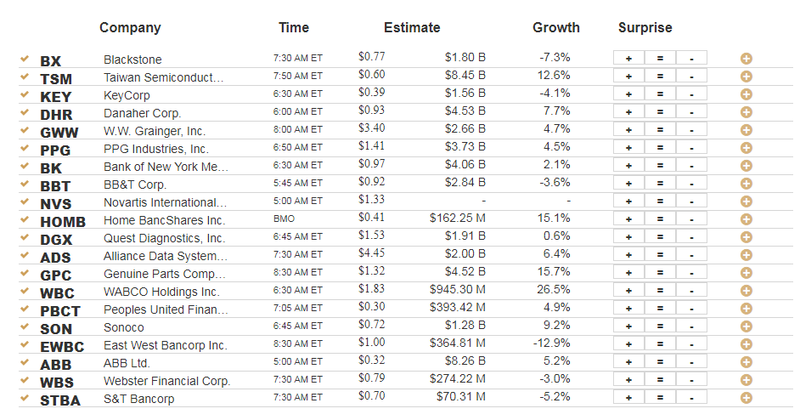 While a total of 43 stocks in the S&P 500 are up over 10% over the last 2 months, in the interest of space, the table below lists the twenty top performers. 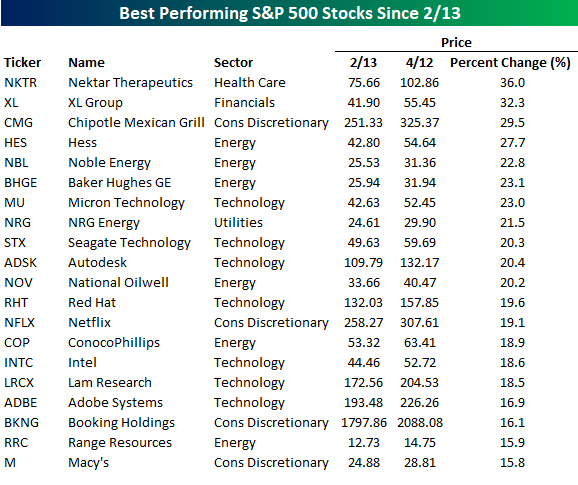 As you might expect given the sector’s leadership, a number of stocks from the Energy sector make up the list with Hess (HES), Noble Energy (NBL), Baker Hughes/GE (BHGE), and National Oilwell (NOV) all up over 20%. The top-performing stocks, however, have been Nektar (NKTR), XL Group (XL), and Chipotle (CMG), with each gaining close to or more than 30%. FAANG stocks had a good start to the year, but the only one that has been able to keep the momentum going is Netflix (NFLX), which is up nearly 20%. 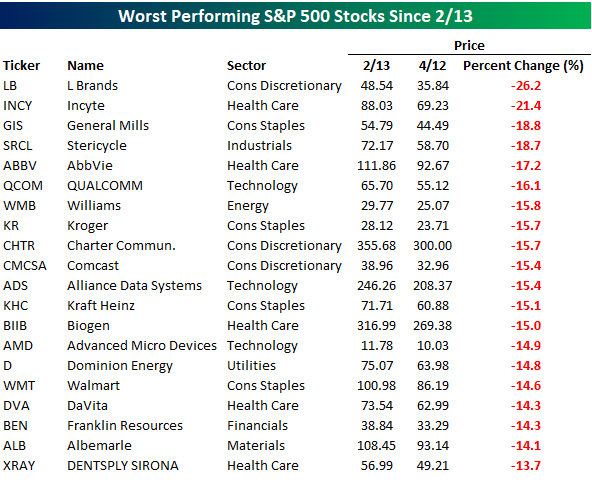 While 43 stocks in the S&P 500 are up over 10% since 2/13, 37 stocks are down 10%+, and in the table below, we list the worst 20. As shown, just two of the worst performing stocks are down over 20% since February 13th, which is actually pretty surprising to us given the volatility. Those two stocks are L Brands (LB) and Incyte (INCY). Looking through the list of losers, though, there are a number of blue-chip stocks such as General Mills (GIS), QUALCOMM (QCOM), Comcast (CMCSA), Kraft Heinz (KHC), Biogen (BIIB), and Walmart (WMT). As we noted back in January, midterm election years tend to be relatively volatile periods—with stocks historically seeing the largest intra-year pullbacks. But why is that? Of course, there are many likely reasons, but one potential reason is that in the past the political party that has won the presidency has lost seats in the House and Senate during the midterm election, generating some uncertainty during these years. Looking at the full four-year presidential cycle also shows that the second and third quarters of the president’s second year in office (so right now) can indeed have bulls frustrated. 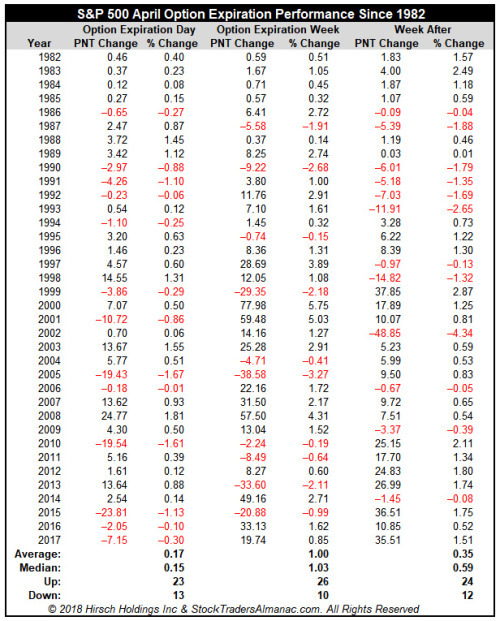 “Going all the way back to the Dow’s inception in 1896 displays that this quarter and next quarter are quite weak historically. But the good news is we’ve seen big rallies after this weakness. However, this is something to be aware of as we move forward in this midterm year,” said Ryan Detrick, Senior Market Strategist. Although we expected more volatility this year, we are seeing some signs of better times ahead for equites. Be sure to be on the lookout for our latest Weekly Market Commentarydue out Monday, where we look at some positive technical developments on equities. April option expiration is generally bullish across the board with solid gains on the last day of the week, the entire week and the week after. 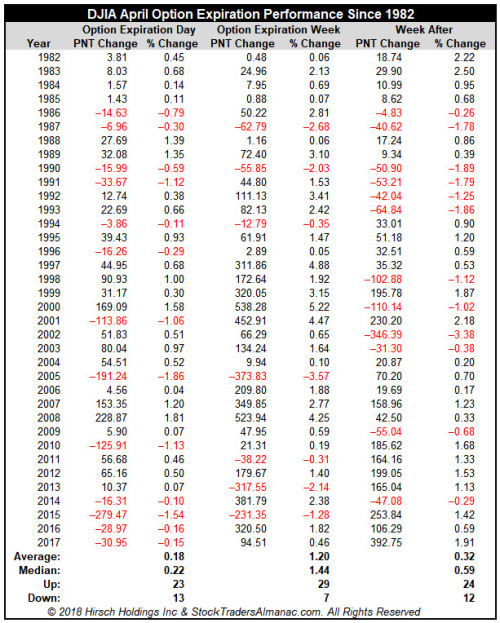 Since 1982, DJIA and S&P 500 have both advanced 23 times in 36 years on expiration day with an average gain of just under 0.2%. 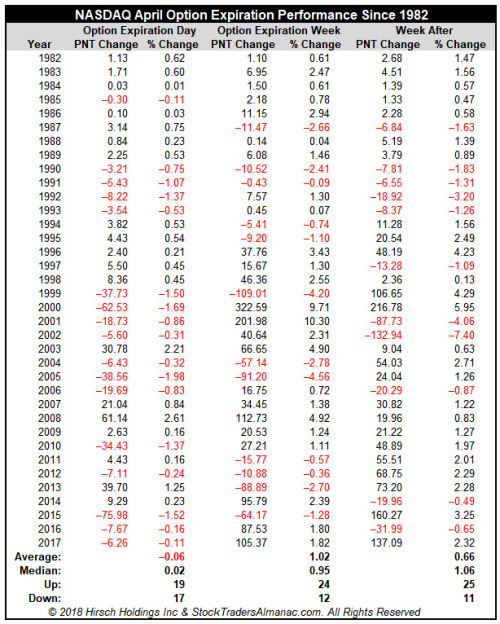 Expiration week as a whole has a slightly more bullish track record over the past 36 years to expiration day. Average weekly gains are 1% or better for S&P 500, DJIA and NASDAQ. The bullish bias of April expiration also persists during the week after. DJIA has posted a full-week gain in twelve of the last fourteen weeks following expiration. Like 2018, 1994 was a midterm election year, the second year of a first term president after a solid market performance in the first year of the term – after a party switch in the White House. We also had a Fed in a relatively new tightening phase as we have now. The current tightening cycle has been going on longer, but in 1994 it started from a higher point and was increased at a much more accelerated pace. 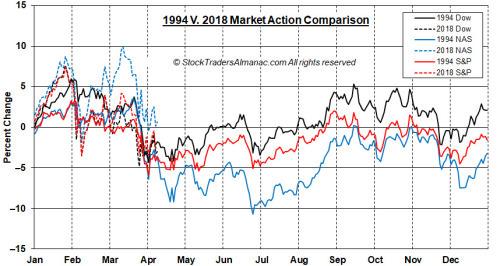 But nevertheless, in the chart above comparing year-to-date 2018 action in the dotted lines to the 1994 market pattern in the solid lines with the Dow in black, S&P 500 in red and NASDAQ in blue you can see a striking similarity. Compared to the typical April pattern over the last 21 years, midterm year Aprils exhibit a noticeably different pattern. In all years, April tends to get off to a sluggish start, but finishes well. In midterm Aprils (visible in the charts below), the month is strong until just after mid-month at which point it rolls over and closes weakly. 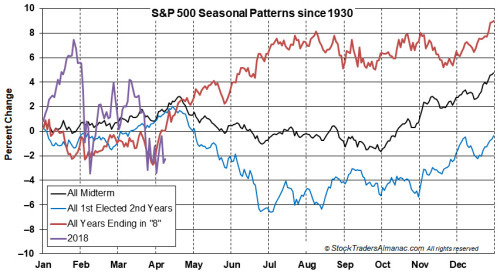 Mid-April is also a clear inflection point in the full-year seasonal patterns. In midterm years and the second years of a newly elected president, DJIA and S&P 500 make a clear move lower after mid-April. 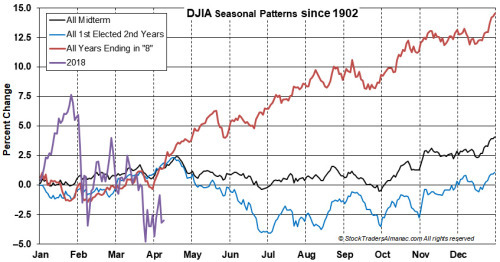 However, in past years ending in “8” DJIA and S&P 500 continued higher through yearend. For the market to take a path similar to past years ending in “8”, trade wars fears would need to abate, earnings season will need to be a homerun and the Fed will need to take a slightly more dovish tone on future rate hikes. 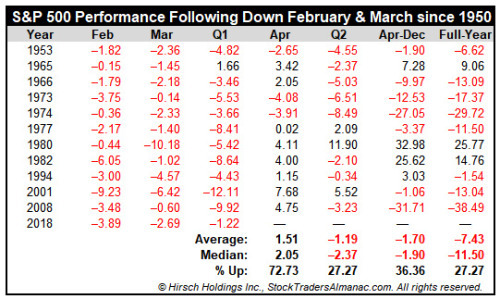 Over the past 69 years the combination of a down February and a down March has occurred 11 times for S&P 500 and 10 times for DJIA prior to this year’s occurrence. 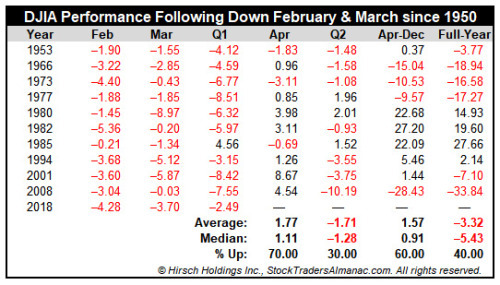 Historically, the market’s performance after back-to-back losses in February and March was well below average and rather bearish in nature. Recent occurrences in 2008 and 2001 were both bear market years. After a bounce in April, Q2 was down more than 70% of the time. The April through yearend period (Apr-Dec) was mixed and full-year performance was negative on average. Stockaholics Daily Stock Pick Challenge & SPX Sentiment Poll for Monday (4/16) <-- click there to cast your daily market vote and stock pick! 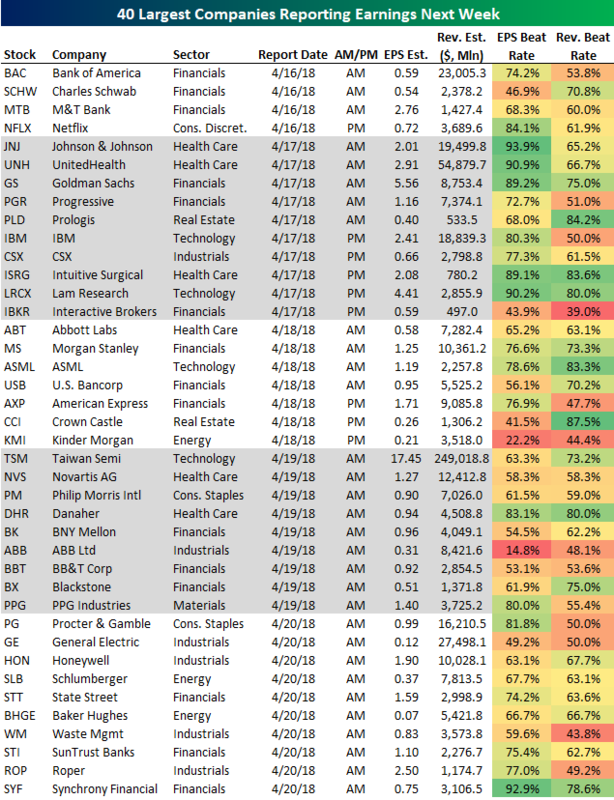 Stockaholics Weekly Stock Picking Contest & SPX Sentiment Poll (4/16-4/20) <-- click there to cast your weekly market vote and stock picks! And finally, we have our mystery chart challenge now up as well! Weekly Mystery Chart & Technical Analysis Challenge (4/16-4/20) <-- click there to participate! Well let's see how the futures will open on Sunday evening. 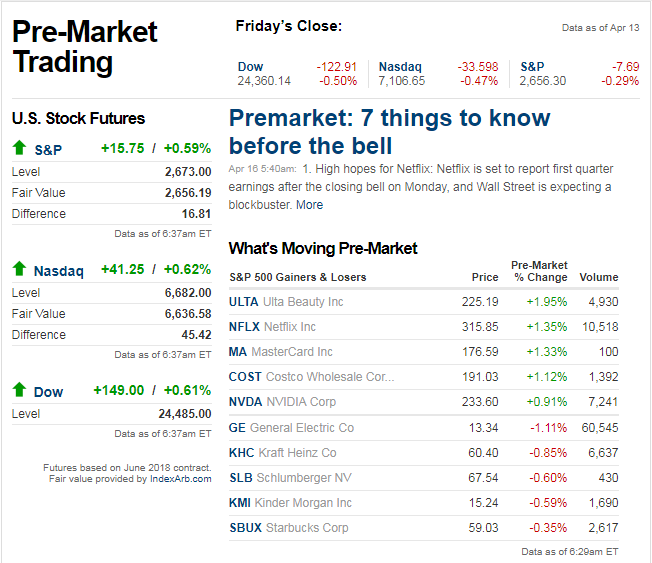 i wouldnt be surprised if there is more reaction to earnings than the news honestly. i think oil is going to have a field day though. "Markets jump on signs war is inevitable; Bush sets 48-hour deadline; terror alert raised." NEW YORK (CNN/Money) - Stocks soared Monday on bets that a war with Iraq is imminent and will end quickly, giving blue chips their best gains of the year and pushing the Nasdaq further into positive territory for 2003.
i cant pull up a chart, but looking at a yearly chart of 2003, it seems there was a sell off sometime in march and the market rallied from there. @bigbear0083 would do it better justice than i in pulling up a chart of march 2003.
stock1234, bigbear0083 and T0rm3nted like this. 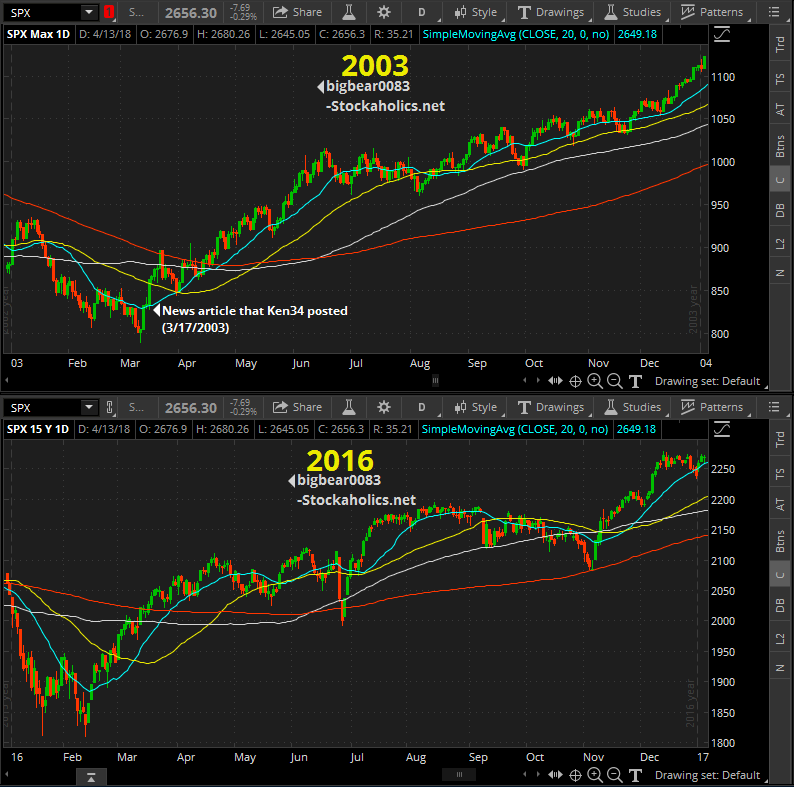 2003 is an interesting chart because it's a bit similar (albeit not perfect) to the 2016 daily chart. there was an early selloff to start the first few months of that year followed by a bounce that did not take out the lows. that year ended up very strong +26.38% but you have to take into account that we were just coming out of a bear market the previous year. the correction in early 2003 was -15.63% from intraday high to low. interestingly our current 2018 early year correction thus far has gotten to -11.84% from the ATH to the correction low. so although in both instances we saw a correction of greater than -10% both years still ended strong. let's see what happens! thx for bringing up that 2003 @Ken34 very interesting indeed. 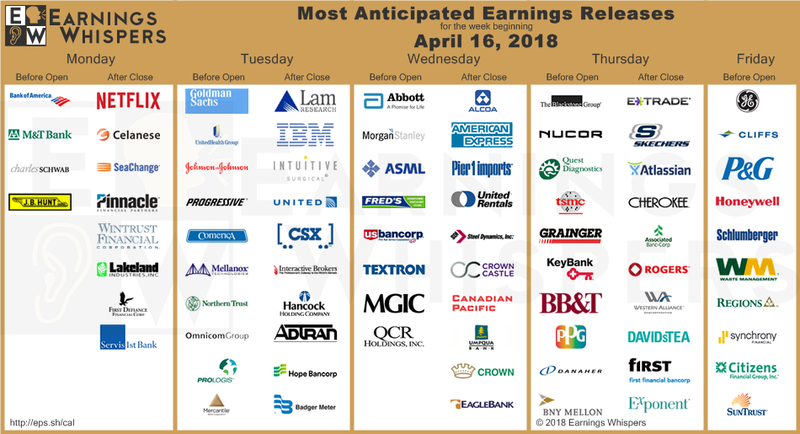 Most Anticipated Earnings Releases for the week beginning April 16th, 2018 <-- click there to view! 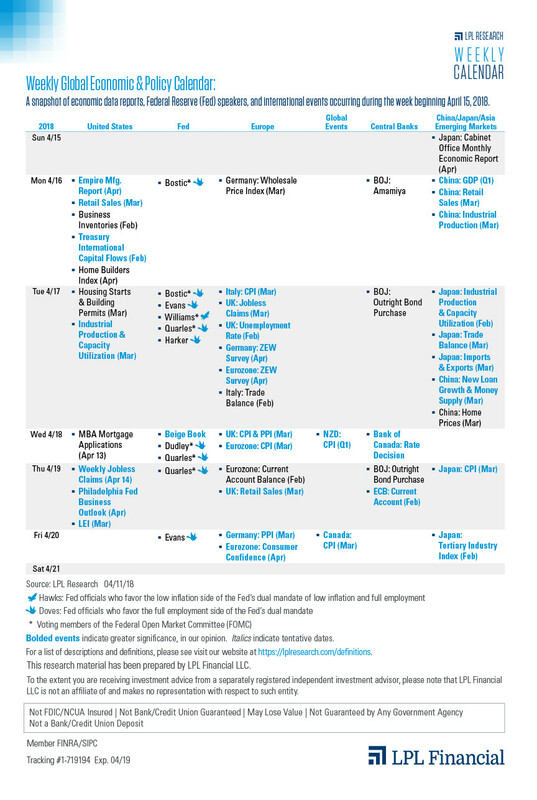 here is a list of geopolitical events that have happened over the years and the market reaction to those events. they have largely been nonevents for the most part. stock1234 and Ken34 like this. ACIA down 20+%, LITE down 7+%. "the U.S. banned American companies from selling components to China-based ZTE Corp. ZTE pleaded guilty to conspiring to violate U.S. sanctions by shipping goods to Iran"
Might scare some people that the US is banning companies from selling to China, but more precisely here the Chinese company pleaded guilty to shipping to Iran.